Home Office doctors gave the go-ahead for experimental drug trials on children at two approved schools in the 1960s, National Archives files show. Parents were not consulted and the issue of consent was left to managers. At Richmond Hill Approved School in North Yorkshire, housing pupils aged 15 and older, the most disruptive boys were given an anticonvulsant drug to see if it would control behaviour. The trial of a sedative on girls at a school near Leeds did not proceed. The proposal had been to give all girls at Springhead Park Approved School in Rothwell, which cared for 14 and 15-year-olds, Haloperidol, a powerful sedative now used largely as an anti-psychotic. Approved Schools were on a level between between a children's home and Borstal. While children were usually sent there by juvenile courts, they were not imprisoned; the sites were funded and inspected by the Home Office and run by voluntary organisations. 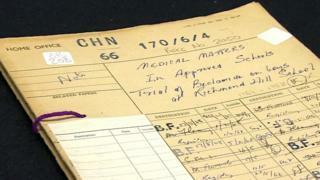 The National Archives files feature discussions about the plans for the drug trials from three doctors who are all now deceased. In a document dating from late 1967, Dr JR Hawkings, a psychiatrist attached to Richmond Hill, wrote to the Home Office asking permission to conduct a drug trial on boys who were "impulsive, explosive, irritable, restless and aggressive". He wanted to give some of them a drug called Beclamide. The anticonvulsant, which has sedative effects and was prescribed for epilepsy, is no longer widely in use. Although Dr Hawkings said this would be "a perfectly normal and legitimate therapy for certain types of disturbed adolescent", he also said that it had not been widely tested on such boys. It was to be a "double blind" trial, with a control group given a placebo, and another group given the drug. But there is no indication that the trial was discussed or explained to participants, or any suggestion that their consent was sought. The papers show Home Office psychiatrist Dr Pamela Mason welcomed Dr Hawkings's plan. "I would recommend maximum support for this project." According to notes on the file, the trial went ahead in 1968, with boys given the drug for six months. There is no record of the outcome in the documents, nor could I find any published paper in medical journals. And the files show the school headmaster told the Home Office that "in view of assurances from the school doctor, from Dr Hawkings… and from the doctor acting for the manufacturers, the managers had decided that there was no need to consult the parents". Bob Hammal, a teacher at Richmond Hill between 1968 and 1972, was appalled to learn of the trial. He remembered there were challenges - but generally recalls a good relationship between staff and the boys. "What really did shock me more than anything was that parental consent was not sought and was not thought to be necessary by the powers-that-be," he said. He believes that had he, or other colleagues, known at the time, they would have tried to stop it, or acted as a whistleblower if that was not possible. As the Richmond Hill trial got under way, a second trial was proposed, again by a school psychiatrist, at Springhead Park Approved School for girls in Rothwell near Leeds. In November 1968, Dr Joyce Galbraith wrote to Dr Mason at the Home Office "in strict confidence". She said she was increasingly concerned about the tone of the school and unrest amongst the staff. To calm the situation, she suggested giving Haloperidol to every girl in the school, for 18 weeks. She wrote: "My suggestion is that we should try some form of drug trial to see if, by allaying the anxiety of the girls chemically, we might perhaps settle the school a little bit more, and give the staff an opportunity to put their own house in order…"
Again, Dr Mason supported the plan. The papers in the the National Archives show she wrote: "I think this sounds a valuable treatment approach to the very real problems that arise from the special nature of girls in residence and in particular the problems presented by younger immature disturbed adolescent girls." Media captionShelagh Sunner: "They weren't mentally sick kids- they were maladjusted kids"
The files also show that Shelagh Sunner, headmistress of the school between 1966 and 1982, did not support the trial. Speaking to the BBC about the National Archives material, she said drugs were not the solution for "her" girls. "They weren't mentally sick kids" she said. "They needed to work through their emotions." The trial did not take place after the school's managers blocked it, worried about what the girls' parents would think. Ms Sunner said she was not surprised, though, that the Home Office endorsed it. "I think they were scratching their head about what they were going to do with this generation of maladjusted kids - because the approved schools were full and there were a lot of them."